We recently discovered that our kitchen sink faucet was leaking. 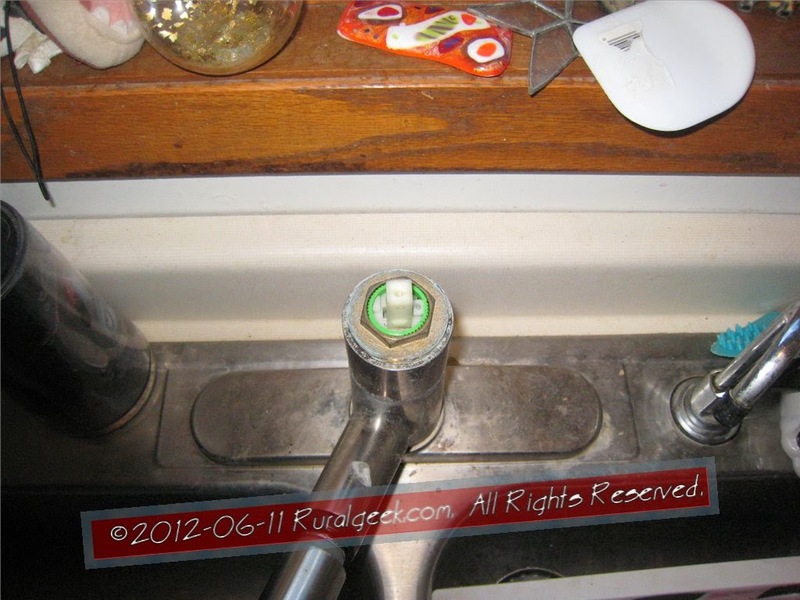 When I disassembled the faucet, I found that the outside housing of the ceramic cartridge that controls and mixes the water flow in the faucet was broken in several places, causing the leak. Removing the cartridge was quick and easy. It involved first removing the little hot/cold indicator button on the handle (prying it out with a small knife blade), revealing the hole to the handle set screw. After loosening the set screw the handle can be removed. Next, the rounded top collar can be unscrewed (in my case I was fortunately able to do it by hand). If it's stuck I'd use some penetrating oil first, along with a rubber work glove to get a better grip. If you need a wrench, I'd suggest a rubber strap wrench as a pliers will likely gouge and scratch the part. That reveals the cartridge retainer nut that can be removed with a wrench. Once I got the cartridge out I found it was marked as a DL02GJ and was dated 06/05/05. 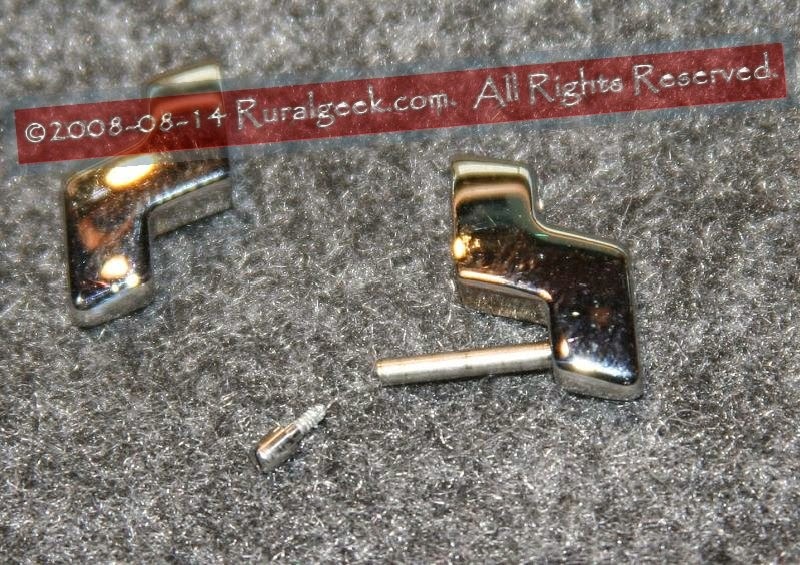 It was cracked on both sides, and the top collar ring had separated from the rest of the housing. I then did what I normally did when looking for parts - an Internet search using the part number. That wasn't much help, only locating Chinese and Taiwanese manufacturers for the part (for instance, Hain-Yo Enterprises Co. makes the cartridge) and dimensions for it. Since we had bought the faucet at Menards, I thought they might stock the part. But a perusal of their replacement cartridges online (they only sell 3 different models) didn't show anything that resembled the one I had (but then there are few details on their listings as well). An examination of the LDR catalog showed it was an LDR 950 10504SS model. 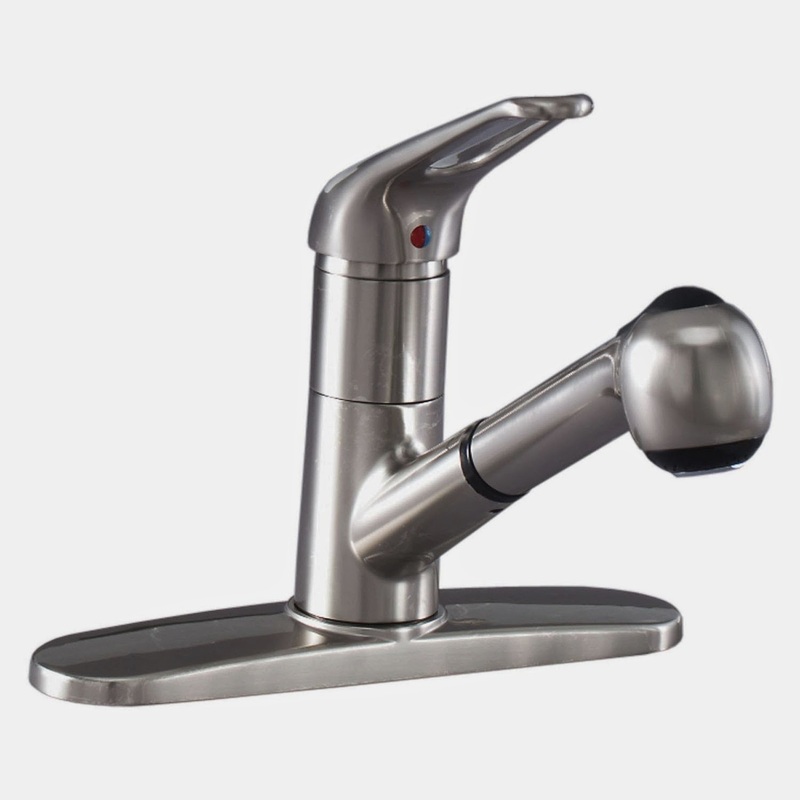 Then I searched using the manufacturer's part number for the faucet and other than listings for sale of the faucet itself found no parts for it. I can thus only conclude it must be considered a disposable faucet, but we're in the process of a remodel and I didn't want to spend the time nor money to replace the faucet right now. So given no other options, I made a run to Menards to see if one of the few ceramic cartridges looked similar to the DL02GJ I had. Not only are the cartridge outside dimensions important, but the bottom has a gasket and two pins that must match the faucet assembly. 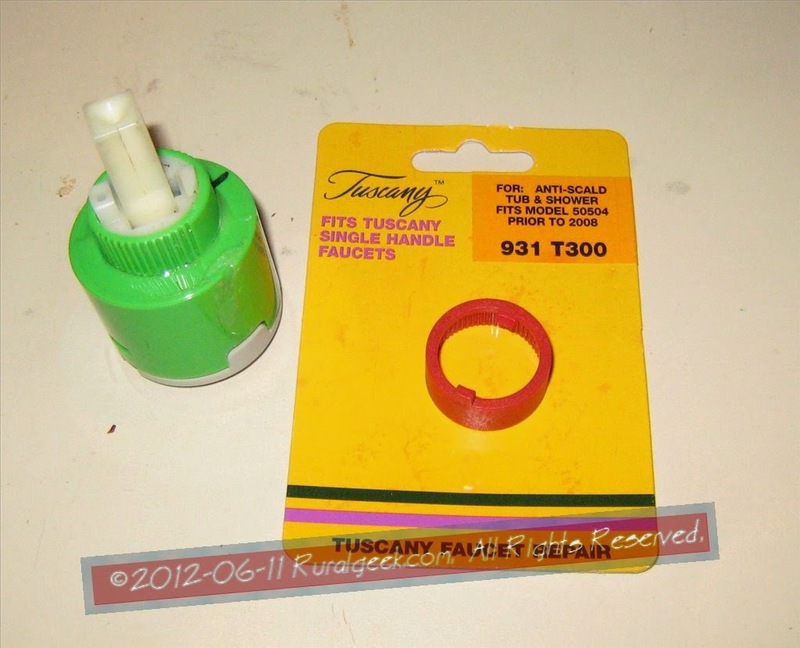 The 931_T300 (Menards sku 6740348) looked very similar; especially the bottom layout and gasket, except it had this red plastic top collar. (FYI - if you do a search on the Menards website for "ceramic cartridge" you won't find this part, because it's listed as a "cermaic (sic) cartridge"). I found however, that the red collar can be removed, and the part ended up fitting perfectly. I quickly reassembled the faucet and the leak was gone. Here's a photo of the old cartridge, the red collar from the new one and the packaging card for the replacement part. Of course, I did a follow-up online search on the 931-T300 part number and also drew a blank. I'm considering buying another spare as a future replacement, given my difficulty in locating the part, but by the time that happens we'll likely be replacing the faucet. Hopefully this post will save someone some time in locating this replacement part. 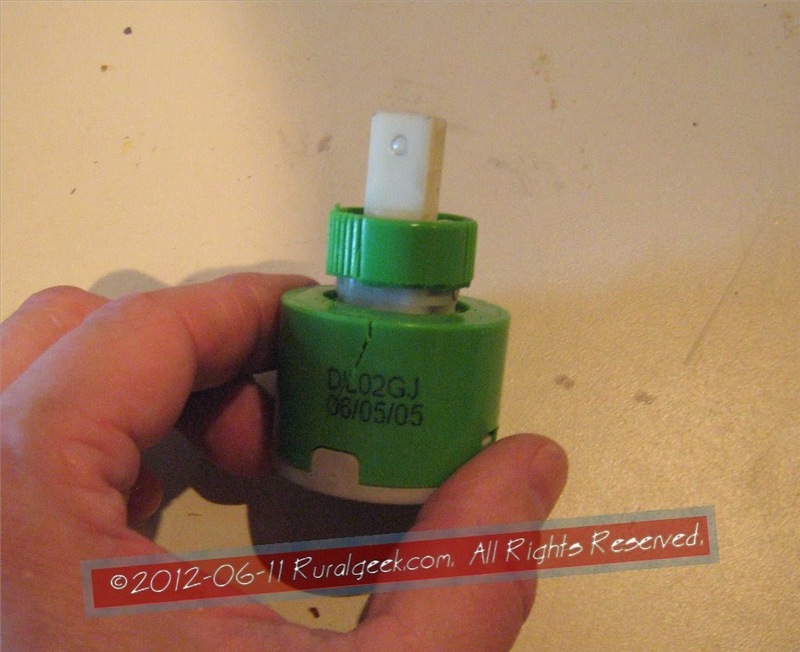 The 931-T300/931_T300 ceramic cartridge (sold at Menards) is a replacement for a DL02GJ. Update 1/27/14 - Thanks to Mike, who commented that this part is now available for purchase from Menards online with shipping to home. My wife got me a Tag Heuer Link watch for our wedding anniversary. Of course the metal bracelet/band needed adjustment for my chicken wrist. I thought of taking it to a jeweler but decided I could probably save myself the time and do it myself. I like being independent and not counting on others for jobs/tasks I can do myself. 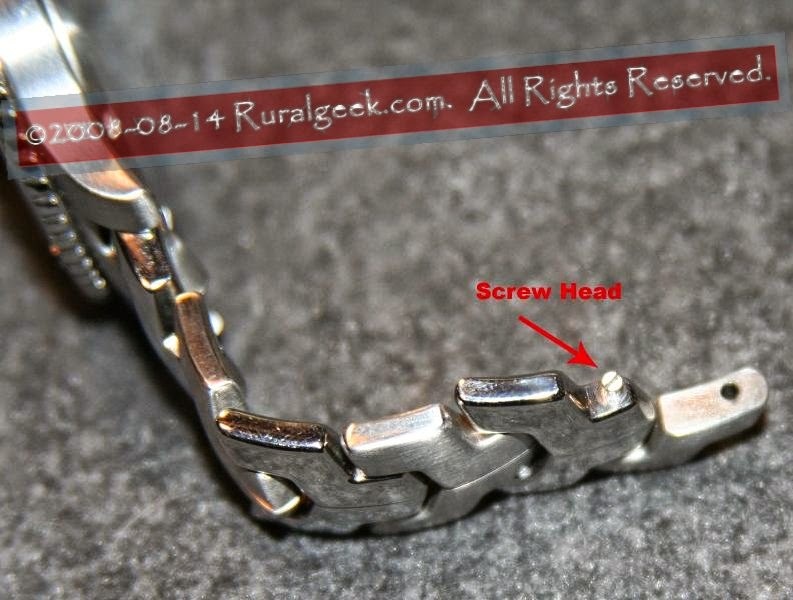 Additionally it gave me the opportunity to examine how the bracelet was put together. I've previously adjusted watch bracelets on my Seiko and Movado ESQ watches. I've also replaced the batteries in many different watches so I'm not a novice to working with them. There are plenty of watch tools, parts and batteries available online for those willing to dabble. My first course of action in such a situation is to check the 'Net to see if someone else had already documented the process. This is a good website documenting resizing of common watch bracelets. However I couldn't find any useful information specific to the Tag Heuer Link bracelet, although I found plenty asking how to do it. 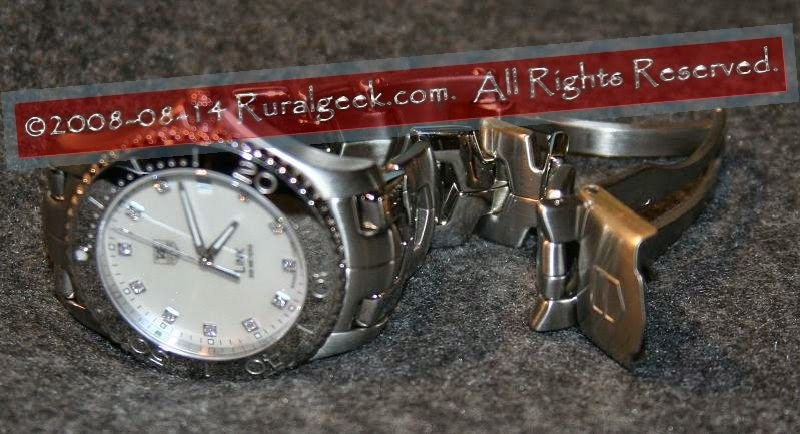 Maybe people who own Tag Heuer watches aren't the kind who adjust their own watch bracelets. I did find a message thread where the person claimed the jeweler he had taken the watch to to have the band adjusted didn't know how to do it. This cemented my decision to have a go at adjusting the bracelet myself. That, and the potential fame of documenting the process here for the world! The bracelet appears to have lots of pin ends and spots to push on, so I tried doing that (gently of course) until I discovered the pins I needed to remove to adjust the bracelet. It's a really elegant and ingenious design for the band. It's also quite simple. Now here's my disclaimer: If you aren't comfortable with working with delicate items or aren't handy or coordinated then don't try this! The bracelet itself is a bit wiggly and thus hard to handle. If you mess up you can potentially void the warranty on the band and/or watch, so be careful and proceed at your own risk! I accept no responsibility if you wreck your watch or band following my instructions! You should work on a soft surface whenever possible and use care not to scratch the crystal (face of the watch). These pins need to be pressed out with either a Watch Link Pin Removal Tool (the proper way to do it) or a sturdy small diameter round pin of some sort (I used a fine jeweler's screwdriver tip) and small hammer. I used the latter, carefully tapping out the pin until I could grab it with a small needle nose pliers and pull it the rest of the way out. If the pin doesn't want to move, try pushing it out from the opposite side. The link pin itself has an indentation nearer to one end than the other. 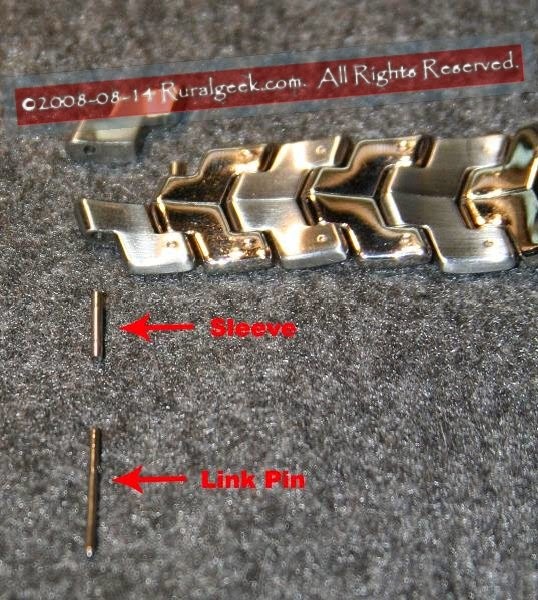 When you replace the pin you want to have this indentation furthest from the end being pushed into the bracelet as this indentation "locks" the pin into the sleeve. You want to remove an equal number of links from both sides of the clasp to fit. 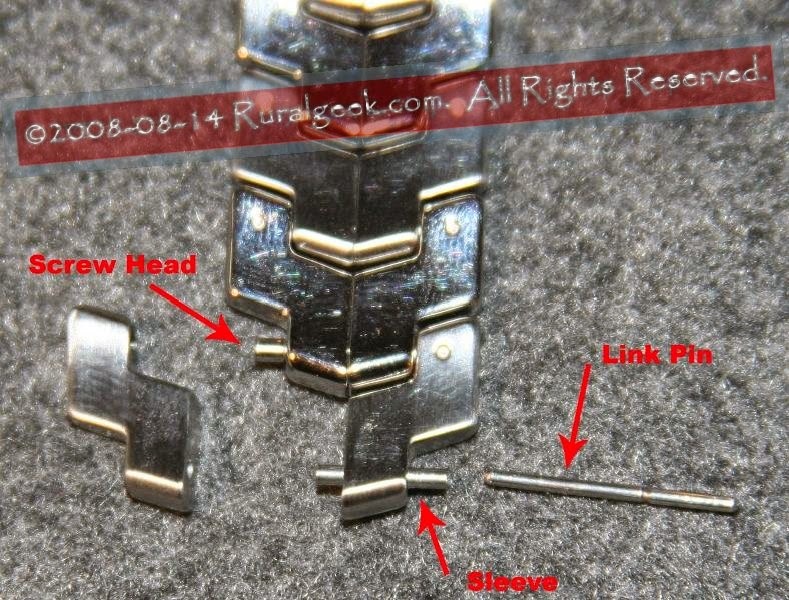 Once the link pin is out, you will see that each link in the bracelet is comprised of two halves. 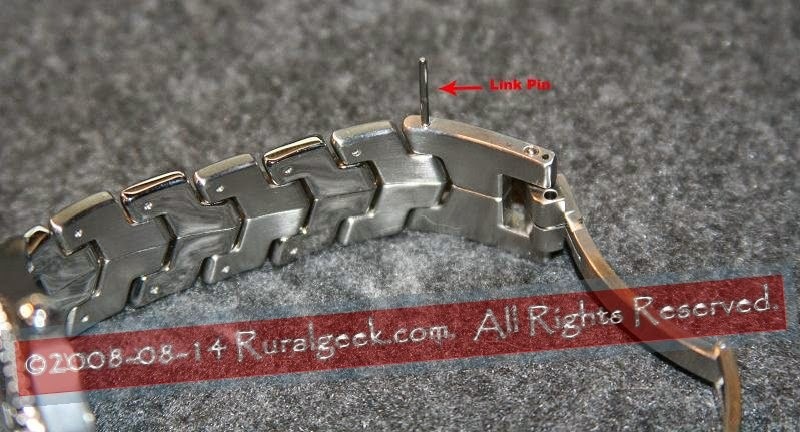 A sleeve aligns the two halves at the top on the link attached to the clasp, and one half is screwed to the next link. 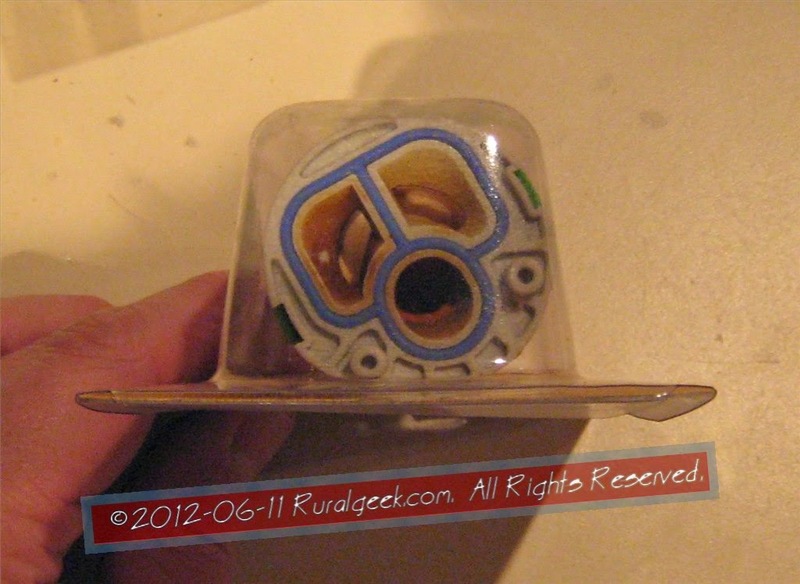 The other loose half simply slips onto the protruding screw head and sleeve (it will only assemble one way). To remove a link, after removing the loose half, you need to remove the screw holding the other half onto the next link. Once that is done you can slip the second half of the link off. All the links are assembled the same way. Also note that the links are assembled on the bracelet alternately with chrome and matte finishes, so make sure the links alternate properly and that both halves of each link are the same finish. Once you have removed enough links from each side, you need to reassemble the bracelet to the clasp. The buckle (clasp latch) goes on the six o'clock side of the watch. Don't forget to replace the short sleeve in top end of the last link before putting in the link pin! There is also a short spring bar/pin that fits in one of three holes on one side of the clasp assembly (shown in the middle of the following photo). This spring pin can be used for fine adjustment of the bracelet length. 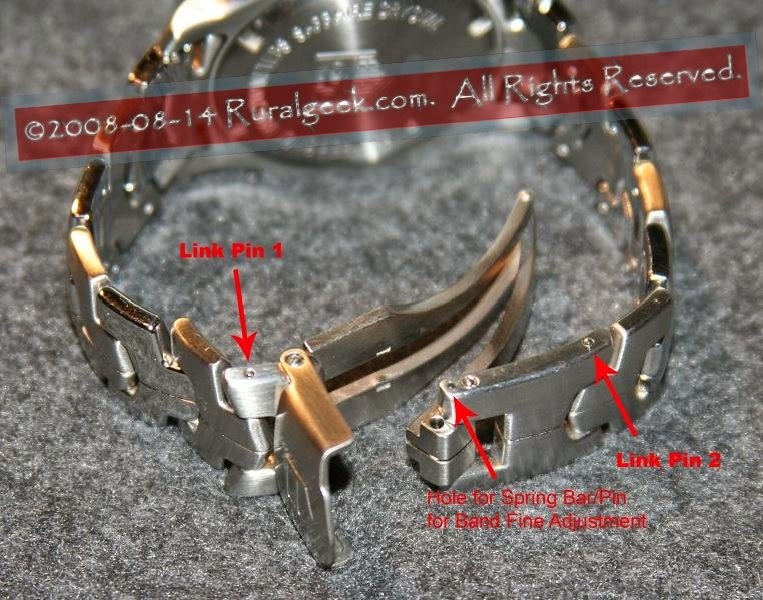 Don't forget to store the spare links/parts in the event you sell or give the watch to someone else. I saved my watchbox so the extra links went into a little ziplock in the box.